Look, no one on Planet Earth doesn’t want to be recognized for their fine work. Or, without the double negative, All the People want to know they’re doing a good job. Yes? Yes. Of course, yes. Which is why a trophy is the perfect medium for appreciation. It’s an award. It’s a forever keepsake. And, personalized appropriately, it shows how well the giver knows you. How deeply you’re seen. How well you’re understood and valued. In the past, all the trophies I own have been given to me by me. Which is fine. Sometimes we need to show Self appropriate regard and esteem. Sometimes we need to remind Self to abandon Self’s wilted posture. Sometimes Self needs to feel fully valued and loved. But today, Greg gave me a trophy. A trophy that shows he’s been paying attention. A trophy that shows he sees my hard work. 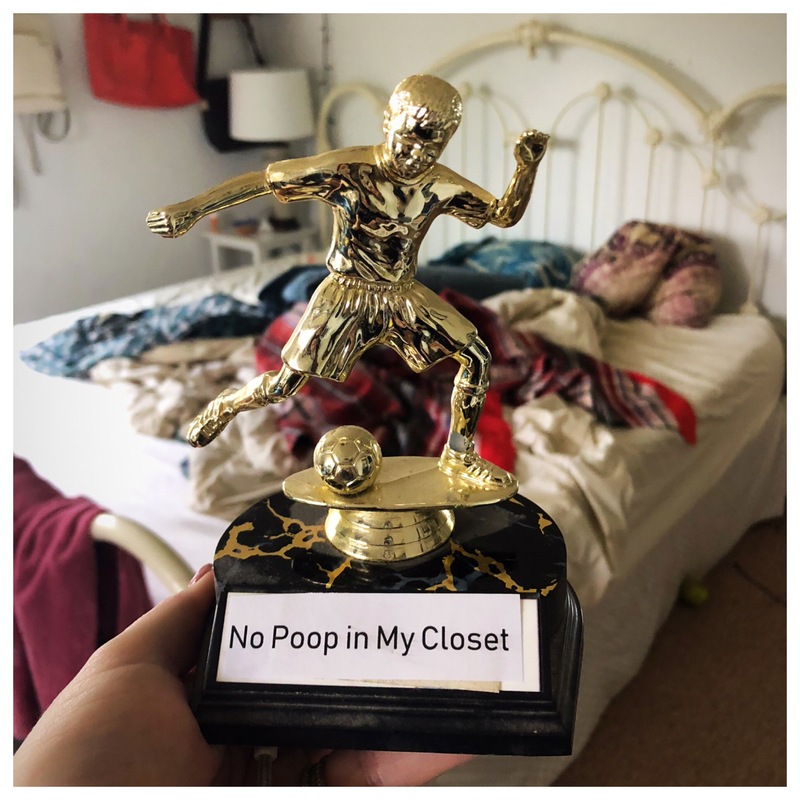 A trophy that marks veritable years of successfully not pooping my closet. Twelve to be exact. More than twelve, actually. OVER A DECADE of not pooping my closet. He could’ve just ignored it. He could’ve just let the fact that I’ve not pooped the closet year after year slide by unnoticed. But Greg, because he loves me, marked all the times I didn’t trust a fart — marked the fact that I’ve finally learned important lessons — with an award I can treasure forever. If that’s not true love, I’m not sure what is. I hope I chose correctly. P.P.S. I asked Greg why he repurposed a soccer trophy for this particular award. He explained that it’s not a soccer trophy, which is obvious in retrospect. This is, instead, clearly a human whose poopy has just fallen out of her pants, and she’s mid-leap trying not to step on it. Since I’ve lived out this very scenario, I’m not sure why it took an explanation for me to see it. 路‍♀️ Sometimes I’m just a little slow. You know what? I get you. I immediately thought of your closet poop post and realized that the soccer was a poop. Perfect choice Greg. And I agree with Jen – the closet would be the best backdrop. If you can get to it, I mean, mine is currently off limits with the amounts of “stuff” around, but isn’t that the whole point?! Sorry November tried to kill you. Glad you’re beating it!! I wan’t want to eat whatever that kid is eating if it results in poops the size of your head. Ouch. I can’t wait for this email to come in at 4 a.m. It’ll wake me for sure, but I’ll have a good chuckle as I roll over and drift back into a (hopefully) poopy-less dream! The appropriate backdrop is the closet. Duh.